6 Signs you have TMJ and what to do about it ! The temporomandibular joint (TMJ) is the area in your body where your jaw meets your skull. It is a common location for problems and it’s important to understand the different signs that can tell you if your experiencing dysfunction of this joint that needs attention. You have pain just in the front of the ear. This is where the TMJ is located. The picture below shows you where the joint is. 2. Your jaw clicks or pops. The TMJ has a disc between the jaw and the skull bones that acts as a shock absorber. This disc normally slides nicely along with the jaw when it opens and closes. Sometimes the disc can fall out position from trauma or other reasons and get stuck. When the jaw tries to open or close, it no longer slides with the disc. Instead, it “clicks” or “pops” over the stuck disc. Sometimes the jaw bone can’t slide over the stuck disc. This can cause the jaw to lock when it is trying to open or when it is trying to close. 4. It hurts to chew. Chewing places stress through the TMJ and uses the muscles that surround it. This will be painful in someone with a problem of the joint. 5. You grind your teeth. Grinding the teeth places irregular stresses on the TMJ. 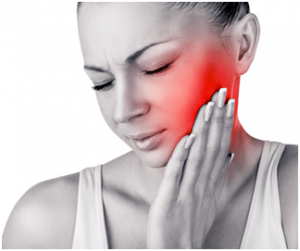 This can create pain and problems with TMJ function. Headaches can be caused from the tightness in the muscles that surround the TMJ and also from the joint itself. If you have any one or a combination or these symptoms, it’s possible you have a TMJ problem. This can happen for a number of reasons including; jaw alignment issues or a past injury to the jaw, grinding the teeth, poor posture, stress, and excessive gum chewing.